Fisheries scientists from the Leibniz-Institute of Freshwater Ecology and Inland Fisheries (IGB) and international colleagues have studied the response of fish in the Mediterranean Sea to spearfishing. The fish are able to finely discriminate if divers carry a speargun or not. They adjust their escape behaviour and keep a safe distance outside the shooting range. This is good for the fish and a challenge for the spearfisher. 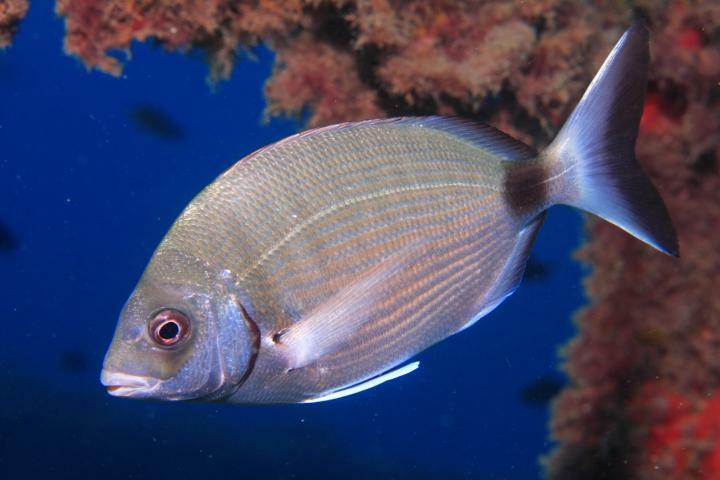 The research team from Germany, Italy, France and Spain observed the behaviour of five coastal fish species in three areas of the Mediterranean Sea – within and outside areas protected to spearfishing. The field study involved simulating a harmless diver on the surface simply carrying fins, but no speargun, and divers carrying spearguns. The response of the fish strongly depended on the size of the fish, what type of diver was seen and whether the encounter was within or outside the protected area. "The more dangerous the situation, the stronger the behavioural response," states Dr. Valerio Sbragaglia, scientist in the Integrative Recreational Fisheries Management research group at the Leibniz-Institute of Freshwater Ecology and Inland Fisheries (IGB). The 'flight initiation distance' was used as behavioural indicator of fish timidity. This measure is defined as the distance a predator can approach a prey before the prey flees. Outside protected areas the large fish started fleeing if a diver with speargun approached at far distance from the water surface. "Large fish are typically preferred by spearfishers, and hence their stronger response to the threat was expected. What was less expected is how fine the fish tune their behaviour to whether the diver carries a speargun or not. This discriminatory ability was evident especially in spearfishing target-fish species," explains Dr. Lorenzo Morroni, co-author conducting fish surveys at the Italian Institute for Environmental Protection and Research (ISPRA). The fish timidity towards the spearfishers was commensurate to the species-specific historical harvesting pressure. Fish behavioural responses similar to the ones of the spearfishing study have also been found in previous studies when fish were exposed to other fishing gears like hook-and-line fishing. "Based on our collective work we propose that fisheries leave a strong legacy in fish behaviour, leading to behavioural adaptations that complicate catching. Knowing this is important for stock monitoring: a fisheries-induced timidity that reduces catchability means that we catch fewer fish than are actually in an area," summarises co-author Prof. Dr. Robert Arlinghaus, who studies and teaches sustainable fishing at IGB and the Humboldt University of Berlin, the meaning of the results.